Outset Israel supported Eyal Asulin’s project Ark that was presented for the first time at the exhibtion Shufuni Ya Nas (Look at Me) at The Artists Residence, Herzliya, curated by Ran Kasmi Ilan. The exhibition “Shufuni Ya Nas” (Look at Me) presents two new projects by artists Meir Tati and Eyal Asulin, each presenting two luxury cars: a BMW and Rolls Royce, both of which have long transcended their existence as simply means of transportation, and been elevated to the status of prestigious brands laden with symbolic meaning. A cultural world has evolved around each of these luxury or “classic” cars, a world saturated with knowledge, imagery, habits and terminology. All these create a kind of map, a technical and metaphorical layout of a desired car, further reinforcing the illusionary relationship between merchandise and its value. In other words, cars are never just cars. Whether cheap or expensive, whether two-seater or four, whether sports car or sedan, cars are always more than just cars. They are a means that allows you to assess, define, or articulate the consumer experience, to manifest motion. Moreover, they are a tool that simultaneously relies on status and gender-based stratification while perpetuating them. 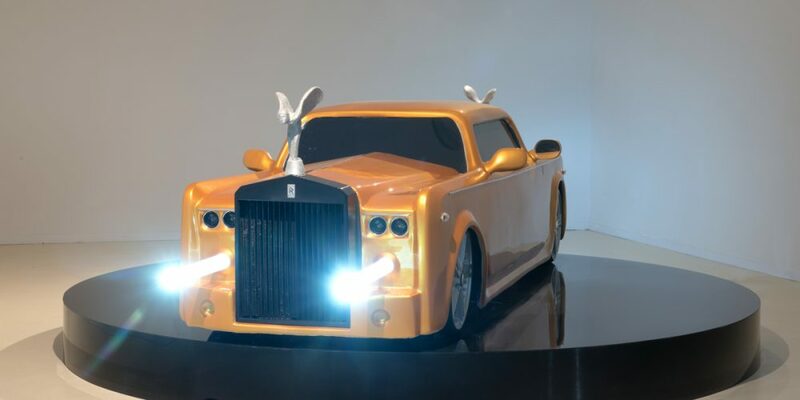 Asulin’s installation – Ark – is a hybrid creation merging the Ark of the Covenant and a Rolls Royce in the form of a two car fronts positioned back-to-back (similar to the car in the film “Kompot Na’alyim” with Yehuda Barkan and Ezra Shem Tov). The Rolls Royce is the most sacred symbol of luxury cars in the world, with only a handful produced each month and all custom designed to client specifications. It is the purest mark of wealth and extravagance, an extreme show of the power of capitalism. The front of a Rolls Royce is designed to impress. For over a century now, the grille bars have been arranged by hand, appearing like the façade of a Greek temple as they support the slanted “roof”, upon which stands the iconic figure of Nike, the goddess of victory. This figurine is called the “Spirit of Ecstasy”, and in this exhibition version it appears an enlarged.